What comes to mind when you think of the word “spontaneous”? I personally like the word and I’ve come to believe that it likes me. Missing out on experiences, especially ones shared with people, is one of my fears in life. I guess you could call it a fear. Or it can be better said that I simply do not like missing out on experiences with people. So I welcome spontaneity and jump on every opportunity I get when it comes my way. Most of the time I go out and make my own opportunities in the meantime. No sense in just sitting around and waiting for life to come our way. To get a better look at this, let’s get the technical side over with: the word synonymous is defined as 1) “having the character of a synonym; also: alike in meaning or significance.” and 2) “Having the same connotations, implications, or reference.”. Now to the more exciting word, spontaneity is defined as 1) “the quality or state of being spontaneous.” (that makes sense) and 2) “voluntary or undetermined action or movement”. I correlate spontaneity with words and phrases like “last-minute” and “flexible” and “living life to the fullest”. What do you correlate the word with? What other words and let’s say even feelings are for you, synonymous with spontaneity? Life is full of great opportunities for spontaneity. 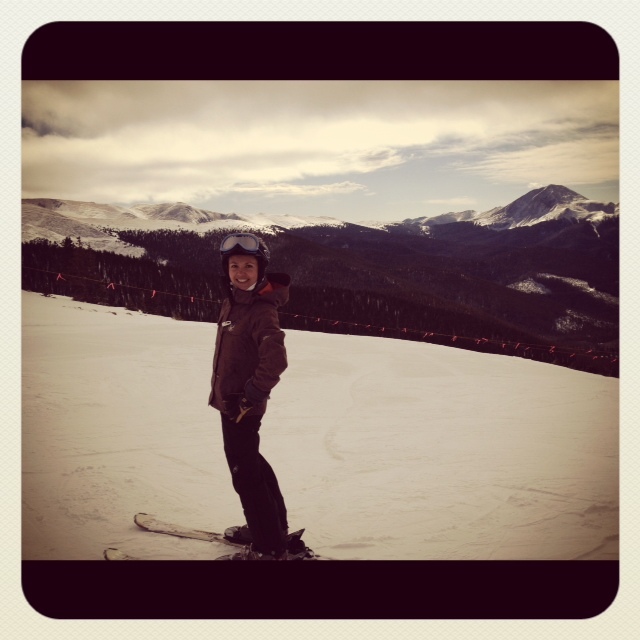 Like this week…I was offered a free ski-in/ski-out condo in Breckenridge for practically the whole week! It came up pretty last-minute and I am so excited to have jumped on the opportunity and enjoyed such a fun time. Now, don’t even start in on your negative, beat-life-down thoughts like “well, you have the schedule” or “you have the money” or “those things are possible only for people like you”…I’m so tired of people who so quickly respond like that. Watch out for yourself and perhaps next time you think like that, maybe even this time, take a good hard look at why you respond like. So now I’ll move on from that soapbox of mine. Getting back to spontaneity…I’m realizing that it gives us the opportunity to be comfortable with change and accepting of the reality that we cannot control life. To be spontaneous, one has to exhibit attributes of flexibility, openness, little control, and being relaxed and having a good attitude…the list could go on and on. What I want to point out is how those attributes are great things to have in one’s life, aren’t they? Would you not want to have those in your life and want for others in your life who affect you to have those attributes? Another great thing about spontaneity is that we can welcome it as opportunities that come our way and we can go out and create it ourselves. So it’s like receiving gifts in life and then at other times, like going out and making life happen for yourself. That jives with my life. Does it jive with yours? One of my favorite things about living in Colorado is going skiing. I’m one of the transplants to the state who didn’t learn to ski until an older age. I was 24 and fortunate enough to be dating a private ski instructor in gorgeous Telluride, Colorado. Needless to say, years of free private instruction was one of the best things I gained from that relationship. I can see now how beneficial it is for anyone to invest the money and time into ski lessons, whether they be group or private, it really pays off. 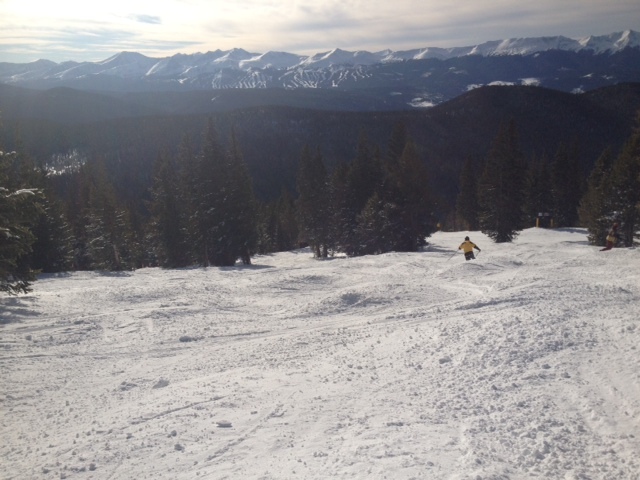 This past week I went to Keystone for a nice weekday of skiing. Being able to go on the weekdays versus the weekend is my favorite part of my schedule right now – you don’t encounter the traffic there and back or the crowds and lift lines on the slopes. My dear friend and old roommate Diane Wood was my ski buddy for the day. The woman has already raked in over 15 days of skiing this season which is pretty good for someone living in downtown Denver versus directly in one of the ski towns. We drove up around 9am, making it to the Keystone free parking lot in less than an hour and a half. The day was starting out promising, with scattered wispy clouds in the blue sky and a bright sun warming up the air. Now, Diane and I have not frequented Keystone more than a couple of times each so we were starting out not knowing the mountain that well. But we grabbed our trail maps on the way in and made conversation with the older gentleman who rode the gondola up to the peak with us. He was a business consultant from Minneapolis who was taking two months off to ski Colorado and then visiting his daughter in Spain for two weeks. Now that’s the life! We all agreed that Colorado attracted a lot of people who wanted priorities in their life that allowed them to travel more and to have a more relaxed work schedule. After discussing our inspirational approaches to life, he recommended the runs on the mountain that were good to ski. So there we go…we had a head start on where the best skiing was for the day. Taking off down our first couple runs, we quickly rejoiced in how warm the weather was. The pit vents in my jacket came open and I adjusted the inner layer I had on to let some cool air in on my neck. As most of us in Colorado know, the snow conditions this season thus far are not as good as last season. For that matter, they’re not good compared to the last decade. Our poor mountains and ski areas just haven’t been getting the snow we need for a better base. The bottom of our skis came face-to-face with this reality as we did a run that ventured deeper and deeper into the trees. Know what it’s like to ski trees and moguls with rock exposure? Well, the bottom of my skis now know what its like. Why so covered up, Diane? It's warm out! It was still so much fun. There’s something about navigating through the trees as they become sparse in areas and then dense again a few feet later. The mounds of snow forming into bumps cascade like a waterfall down the steeper terrain and then flow along where the terrain levels out. An obstacle course is what it’s like and a fun one. It reminds me of playgrounds when I was kid and the momentum one gets when you’re having fun at something. Here is where it started…from deep inside and without any effort…as I was skiing along and avoiding trees and flying over bumps, a hoot and then a holler arose. And it was from within me! This was the natural and joyous response of not only my body, but my mind as well. If I were a scientist, I have no doubt that I would have been fascinated by the response of endorphins and chemical releases in my body that were flooding my mind. The result…an amazing release of excitement and happiness in the audible form of hoot’in and holler’in. Now this is fun! This is life! After the thrill of the trees, we found our favorite lift – the Outback Express. With the majority of runs being black diamonds and then a few great blues, it had fun terrain that included traditional downhill and then great moguls along-side the trees. We stuck more to the blue runs since the snow wasn’t the best and we wanted to avoid the rocks. Bighorn was our run of the day where we mainly stuck along the right side (skier’s right that is) and practiced our mogul skiing. Some of the bumps were a bit sloppy starting at the top, but mid-way down they were pretty decent and we had a blast. Before the day wrapped up we found the Porcupine run to the left of Bighorn. At first we started in on Pika, a black run which opened up nicely into the blue level run of Porcupine. The slope afforded us beautiful open vistas the whole way down and the glade of trees was sparse versus the trees we had skied in earlier in the day. The moguls were larger too and more spread out until further down where they became smaller and more compact. The diversity of them kept us on our toes and we properly wore ourselves out by the end of the day. The hoot’in and holler’in only increased as we did more and more moguls throughout the day. Even though it takes more out of you and the pole planting can wear out the arms, there is something about the exertion that is invigorating. It’s downright contagious and we found ourselves going back for more and more moguls! What I found to be a great technique, since I consider myself to still be learning mogul skiing, is to ski with music. Finding a song that has a beat you’re comfortable with can really set the pace and helps you establish a rhythm. Having a rhythm, I’ve come to learn, is crucial to successfully skiing moguls. Once you have your tunes of choice cranking you set your eyes ahead, navigating in your head the upcoming route over and in between bumps, keep your knees bent and juicy, and make sure your body is kept facing forward down the mountain. I like to think of it as similar to salsa dancing…it’s all in the movement of the body from the hips down and following the rhythm. Oh, and of course don’t forget to use your poles effectively. Making sure to keep your hands out in front of you 1) keeps them out of your way and 2) helps you pole plant as you need to, which keeps you aggressively leaning down-mountain and therefore more in control of your speed…believe it or not. As I rested at the top of the blue run Procupine, I gazed out at the vista and took in the amazing feeling of freedom and joy…to be in the outdoors under these Colorado blue skies and sailing down dazzling snow-covered mountains…the exhilaration can only be expressed by hoot’in and holler’in. 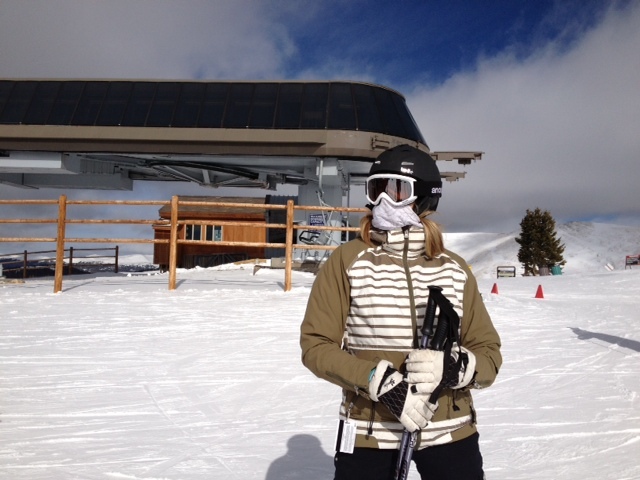 And this was skiing less-than-great snow conditions…imagine how I hoot and holler when its fresh powder and great snow! This was a good warm-up. So next time you get to enjoy skiing the moguls or experience something that thrills you, don’t you dare hold back…make sure to hoot and holler. 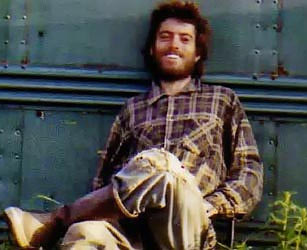 Chris McCandless - later known as Alexander Supertramp, subject of the book "Into the Wild"
A few years ago I found this quote framed in a home. It was when I was working in the real estate industry and I was showing the home to buyers. Immediately the quote resonated for me and made sense to me. It seemed to bring a comfort of its own, even in the midst of challenging comfort. It made me feel that I wasn’t crazy for wanting such an exceptional life and for craving change. Change…the quote gave me a new perspective on change. A lot has happened and changed in my life since then…but isn’t that how life works? If there is any one thing you can count on, it’s the fact that things will change. There’s always change. And if anything, my connection with that quote seemed to open up my life to truly embracing what it meant. This quote poses a few questions for me: How do I initiate change and how do I handle accepting change? What kinds of changes make more impact – internal changes or outward/material changes? Which should come first – the internal or outward changes (think the chicken or the egg concept here)? And my personal favorite, how essential is “willingness” in the whole scheme of change? What questions do you ask yourself when you read the quote? Now this does tie back to the theme of my blog (experiences)…I thought of this recently when I began taking an inventory of the recent experiences I have had. My life has recently had an immense amount of change. Some of it is change that I have initiated and some is change that is affecting me from outside myself. Traveling has brought about quite a few of the external changes – from missing connecting flights and being stuck in Seville for New Year’s Eve (like that sounds horrible), to going back to work for myself and simplifying my life to less than 20 storage bins…change is the theme of what I am experiencing. I like seeing the evidence of these changes as well – less work stress and more creative work, more time with family and friends, and new friendships. Don’t get me wrong though – I’m not saying that security and stability in and of themselves are bad or wrong things. They’re great and natural to pursue, achieve, and healthy to have in our lives. What I am saying is that I’m discovering it looks different from what most people say it looks like. How’s that you ask…well, I don’t need furniture and an established house to feel settled. I realize that this also has a lot to do with personality – being open to and initiating of change does not mean you have to go without owning a home and furniture. It depends on knowing yourself and your personality and on seasons and phases in life. I’ve certainly had my seasons in life where I lived in a home with my furniture and a yard and the 9-5 job…in getting to know myself and as I came into a new season in my life, I found I didn’t want those things and for that matter that I don’t need those things to feel secure and stable. So we can see that this quote brings change to my mind, but what does it say to us about security being dangerous? Can security be dangerous? I think it can be dangerous in a subtle way. The quote seems to be telling us that if we do everything simply for our comfort and security, it can squelch a spirit of adventure. To which you may say “Well, I’m not adventurous”. Nothing wrong with that. Despite what securities and comforts we have in our life, we can still nurture an adventurous spirit in the form of a willingness to initiate and accept change in a positive manner. when my unwillingness to initiate change within myself, and/or the way I accept change outside of myself, is harming or could harm others. The same year I found this quote I framed it and gave it as a Christmas gift to someone very special in my life. At the time, that person liked change and recognized it – that is, in everything but within themselves. The more they were unwilling to initiate change within themselves, the more they handled external change poorly. This became dangerous not only to me, but continues to be dangerous for them and those in their life. Maybe that is one of the harder things in life…the willingness to initiate change within ourselves. I’ve come to believe that it is where it is the most important. It has taught me that willingness is essential to initiating and accepting change and most importantly, that it has to start within ourselves. I cannot change others, only myself, and I cannot make others willing, only myself. Here’s to initiating and embracing change and going without the dangers of security! I love to travel and tend to think that I’m a pretty good traveler. Why is that? Traveling is one of those activities in life that can be full of the unexpected. As much as one plans and schedules, if something can go wrong or change on you, it probably will. When I travel, I’m pretty good at rolling with the unexpected. To really enjoy traveling, you have to respond to unexpected situations and changes in plans with as little, or preferably zero, freaking out as possible. The situations can be stressful, yes, but that doesn’t mean that our responses have to be stressful on top of that. More importantly, I have found time after time that when I look back I can see great reasons why I was meant to miss that flight or why the hotel lost my reservation. A prime example and my most recent favorite, is this past trip that I took to Spain. I arrived back in Denver just last Friday and am still seeing the end of the trip as my favorite part of the two-week vacation. Originally, I was supposed to arrive back in Denver Thursday evening. But as the traveling fates would have it, my first flight from Madrid to Frankfurt arrived late and I missed my next connecting flight to Chicago. Now, here is where I will be unashamed to promote Lufthansa Airlines because they provided great customer service. The gentleman that assisted me at their ticket desk was efficient and quick to get me re-booked on the next best flight and it did turn out to be much more convenient than my original flight plan. What I also appreciated was that he talked with me of the options and made sure to explain the benefits and negatives of the choices I had. By the time all was said and done, I was grateful to be booked on a direct flight to Denver the next day that left around noon and arrived mid-afternoon Denver time. I was also put up in a hotel complimentary of the airline and provided with a dinner voucher and breakfast. This gave me the chance to rest and enjoy a good night’s sleep in a comfortable bed. I was actually excited because the two mornings prior, I had to wake up ridiculously early and I’m not the best at sleeping on flights so I was pretty tired at this point. This first part of the story is what I like to think of as the “rhyme” of traveling. A rhyme has a rhythm to it, with beats and sounds that I like to see as the people and plans that unfold in one’s travels. 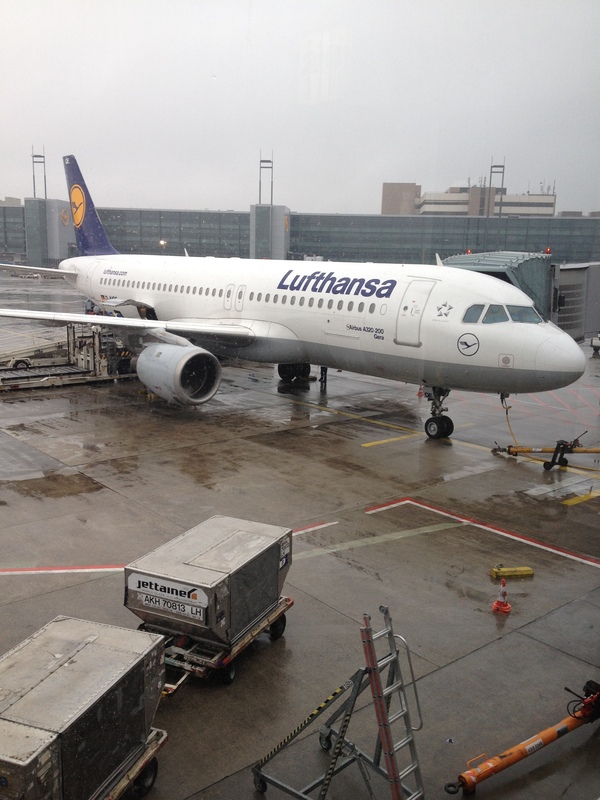 In this case, my original travel plans took on a rhyme that involved the Frankfurt airport, the Lufthansa customer service personnel, and eventually my hotel accommodations and new friends I would soon make (we’ll get to that part soon). Now I believe that the most important and influential aspect of the rhyme is how we respond and handle the situation within ourselves and in our interactions with others. Here is where we have the most control and influence of the situation since we can really only control ourselves. I could have chosen to respond frenzied and angry, making for a stressful and unpleasant “rhyme”. Instead, I realized that it wasn’t going to help or change anything to react negatively and take things out on others. I just simply didn’t want the stress for myself either. And in those few minutes that I took to stand still at the closed gate, I chose to relax and be calm. This is where I started to feel at peace and at the same time excited….I realized, there was a “reason” for this happening. So the “reason” part of traveling…I love this part because it is the take away of the whole travel experience. The “reason” in this particular story of my travels was to make certain new friends. And I’m so glad that I did. Into the story enters my first new friend, Mihel (as he refers to for English speakers, Michael). After getting taken care of at Lufthansa Customer Service, I was waiting for the free shuttle to my hotel and noticed after an hour had gone by that the only other person still waiting was Mihel. I asked him what hotel shuttle he was waiting for and it turned out that he was going to my same hotel, had missed the same flight as me, and was re-booked on the same flight the next day. We decided from there to share a cab, which he graciously paid for since he was traveling for work and it was a business expense. As a result, I had great dinner company and breakfast company, gaining a new friend who is from Croatia and travels extensively. It was so edifying to learn more about the culture of Croatia and what his life there is like and how he grew up. We discussed my own American and Hispanic cultures, comparing our countries’ points of view on everything from family to politics to religion. Overall, I found that my approach to life is very European (big surprise there). From there, my next reasons showed up on the flight to Denver, embodied as two Israeli young men, Diego and Daniel. Can I just say, I had the best time on that flight and the three of us had to be having the most fun out of everyone on that plane. Not only that, but it turns out that they manufacture composite electric guitars for their company called Viktorian. I have a mother who plays Spanish guitar, I play acoustic guitar myself, and my two younger brothers have quite the talent with the guitar as well. Do you see a commonality here? It wasn’t just guitars and business that we discussed though. We laughed about accents, shared about our families and cultures, and learned new words in Hebrew and English. What was most fascinating to me was to hear their stories of life in Israel with the strong influence, many call it dominance, of the combination of religion and politics. There is no separation of the two in their lives and country and to hear their insight and learn of their perspective and how it affects them, was eye-opening. It has me thinking about things in a new way regarding my own country and culture. I could go on and on about my new friendships, but it’s details that are still unfolding. Full of coincidences and what I love to refer to as “small world” episodes, the rhyme and reason of this part of my trip is very special to me. I can sincerely say that I’m so glad that I missed that connecting flight. After all, making friends is one of the most enriching things in life. Just like travel is. You could say that they both can turn out for our best.